Big Valley Builders founder Tim Smith started working construction during high school and college in New Mexico. In his early 20’s he moved to the northwest to become a ski bum but soon realized that would not make a sustainable career. He returned to construction in a variety of capacities and eventually helped to found Bellingham Bay Builders, a workers cooperative in Bellingham, WA that still thrives today. Tim and his wife Kathy moved to the Methow Valley in 2007 to be closer to the activities and the mountains that they love. It was then that Tim started Big Valley Builders. 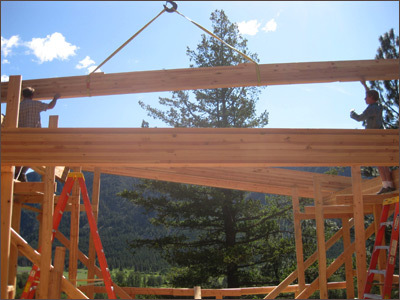 Tim brings a wide variety of construction and general contracting experience to his business along with a strong background in timber framing. He and his crew are dedicated to building durable, handsome structures that enhance the natural environment. When not at the jobsite, Tim can usually be found skiing, biking or enjoying a tea party with his daughter Wylie.